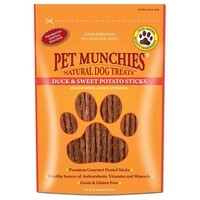 Pet Munchies Duck & Sweet Potato Treats are premium gourmet dental sticks made from 100% natural human grade duck and sweet potato. Designed satisfy your dog’s natural instinct to chew, Pet Munchies Treats help reduce tartar and plaque for healthy teeth and gums. Grain and gluten free, and a great source of dietary fibre, the treats are also rich in vitamins and minerals to promote a healthy skin and coat.